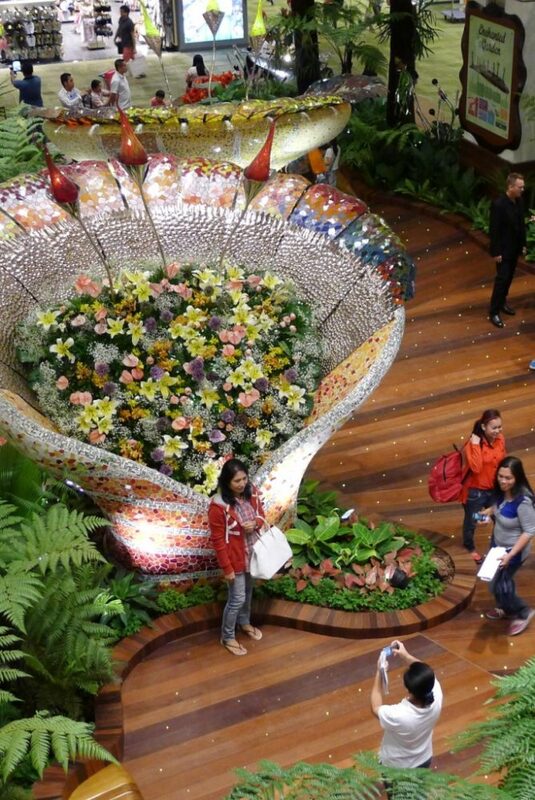 Among the many amenities at Singapore’s Changi Airport are themed gardens – a cactus garden (Terminal 1), an Orchid Garden and a Sunflower Garden (Terminal 2) and the Butterfly Garden (Terminal 3). There are also an ever-changing array of seasonal floral decorations that can take your breath away. Evidently that’s not enough. Because now there’s a brand new garden at Changi Airport: in place of the Fern Garden, there’s now an “Enchanted Garden” in the Terminal 2 departure transit mall. In the center of the garden are four giant glass bouquet sculptures decorated with a mosaic of reflective and shimmering stained-glass. Freshly-cut flower and ferns are nestled inside the glass bouquets. The garden isn’t just pretty to look at: it’s interactive. As passengers walk by, motion sensors trigger nature sounds and the ‘blooming’ of flowers as well as sparkling lights in the floor. There’s also a fish pond stocked with koi and archerfish and opportunities to feed them. Chicago’s O’Hare International Airport now has a farmer’s market selling basil, cilantro, thyme and other fresh herbs grown inside the airport’s aeroponic garden, fresh fruit from a local produce vendor, healthy snacks and to-go meals and, soon, products made with honey harvested from the airport’s apiary. 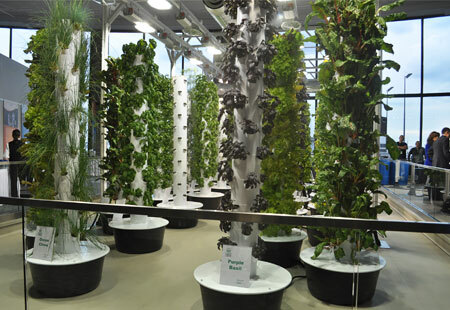 Until now, most all the produce grown in O’Hare’s aeroponic garden was used exclusively by some of the HMSHost airport restaurants, including Tortas Frontera by Rick Bayless, Blackhawks Restaurant, Wicker Park Seafood and Sushi, and Tuscany. Now passengers can take home some of the surplus herbs, which are packaged in nice to-go containers. The O’Hare farmers market is located in Terminal 3, right below the O’Hare Urban Garden in the rotunda area near the entrance to Concourse G.
Given how green and sustainable O’Hare has become, I wouldn’t be surprised to soon see eggs for sale at the airport laid fresh that morning by a free-range flock of airport chickens. Offering travelers the world’s largest airport slide, a transit hotel with a roof-top pool and free foot massages, live entertainment, movie theaters and computer games, Singapore’s award-winning Changi Airport consistently tops the posh chart. Posher yet: five fanatically-tended-to themed gardens displaying, respectively, ferns, orchids, cactus, sunflowers and more than 1,000 live butterflies. Posh perusing is available at Taiwan Tayoun International Airport, which now has a library with 2000 paper books and 400 e-titles for passengers on layovers. The much larger Airport Library at Amsterdam’s Schiphol Airport opened last year. The “sitting area with added value” offers a multi-media collection of books, films and music about Dutch history, culture, art and literature. Maintaining a posh state of mind in transit is easier if you look and feel great. Thankfully, spas offering manicures, haircuts, facials and back, neck and foot massages are becoming commonplace in many terminals. At Finland’s Helsinki Airport, relaxation goes a step further: a Finnair-branded spa offers a choice of spruce, stone, steam or a traditional Finnish sauna. They say music hath charms to soothe the savage beast. So can music relax stressed-out travelers? We think so. Especially if you catch one of the regular concerts offered at airports in Austin, Nashville, San Diego or San Francisco. The poshest airport musical act may take place at Portland International Airport, where John English (“The Voice”) delivers Frank Sinatra tributes twice-weekly. For more, see the full posh airport amenities slide show on Bing Travel – or check back here tomorrow. Snowstorms, mudslides, rain, more rain, and tornadoes. Sounds like a good time for a trip to Hawaii. If you go, or just want to dream a bit about going, be sure to check out the slide-show I put together for MSNBC.com – Cheap and Offbeat Oahu – about activities that are free, cheap or bit offbeat. If you’re going to go to Oahu, you should also pop over to the Big Island. And if you do, you’ll be able to visit the Astronaut Ellison S. Onizuka Space Center at the Kona International Airport. On January 28, 1986, all seven crew members were killed when NASA’s Space Shuttle Challenger exploded less than two minutes after launch. One of those crew members, Ellison S. Onizuka, was Hawaii’s first astronaut. To space center has oodles of fun, hands-on activities as well as exhibits that include a moon rock from the final moon landing of Apollo 17 in 1972, an authentic NASA space suite, and personal items that belonged to Ellison Onizuka. My favorite items in the collection are the freeze-dried macadamia nuts and the freeze-dried Kona coffee that NASA created especially for Onizuka. Today’s astronauts can still choose these items from the space menu. I had loads of fun touring Singapore’s Changi Airport today and wanted to share a few photos of the some of the fun, unusual, and very useful amenities this airport offers. There are napping areas throughout the airport, including some lounge chairs that include alarm clocks (!) and I found these ladies enjoying some of the airport’s complimentary foot and leg massage machines. And, in case you’re not quite awake, I guess, this giant coffee cup is around to remind travelers that on Monday mornings through mid-February, there’s free coffee for everyone.